Rapid Set 25 lb. Cement All Multi-Purpose Construction Material is ideal for most types of concrete work when rapid strength gain, high durability and low shrinkage are desired. The material sets in 15 minutes and hardens in 1 hour. QUIKRETE All Purpose Gravel is a multi-purpose gravel used for decorative and landscaping applications. It can be used for drainage, walkways, window wells, fish ponds and mixed with sand and cement to make concrete. QUIKRETE Fast-Setting Concrete Mix is for construction and repair of concrete where rapid setting is required. Use for projects such as driveways, sidewalks, patios, steps and footings. Use where a thickness of 2 inches (5 cm) or more is required. QUIKRETE Mason Mix is a contractor grade mortar for the construction of brick, concrete block, stone walls. It can also be used repair mortar joints and as a base coat for stucco repair. 25 lb. 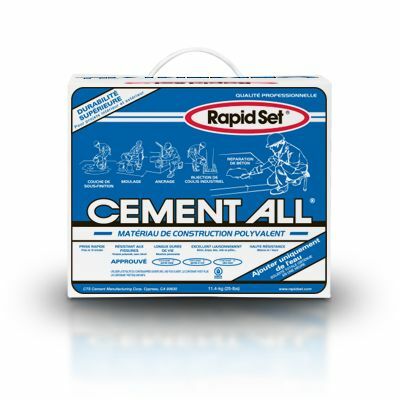 Cement All Multi-Purpose Construction Material Rapid Set 25 lb. Cement All Multi-Purpose Construction Material is ideal for most types of concrete work when rapid strength gain, high durability and low shrinkage are desired. The material sets in 15 minutes and hardens in 1 hour. 25 lb. Cement All Multi-Purpose Construction Material is rated 4.5 out of 5 by 88. Rated 5 out of 5 by RK from Best concrete I’ve ever used!... Best concrete I’ve ever used! Rated 5 out of 5 by HomeDepotCustomer from Very easy to work with...I highly recommed.... Very easy to work with...I highly recommed. Rated 4 out of 5 by Emat from Good product, but the 25 lb box is too much.... Good product, but the 25 lb box is too much. You should also have it available in a 10 lb box like you did last year. Rated 5 out of 5 by angie from I really like how fast it cures, perfect for my... I really like how fast it cures, perfect for my creations. with my store in Macon. ga would keep it on hand. About ONE sq. ft. of cement from the garage wall has fallen off. I was wondering if this product is good for repairing the cement wall. Please help. SAKRETE Parging Mix is the best choice for this repair. More information is at http://www.kpmindustries.com/KingHomeImprovementProducts/wp-content/uploads/sites/12/2014/02/SAKRETE-Parging-Mix-TDS-ENG-REV.0004.pdf Here is some product information for you. SAKRETE Parging Mix is a pre-blended, ready-to-use, cement mixture with superior bonding, specifically designed for finishing concrete blocks or poured concrete walls, above and below grade. Use to level imperfections up to 10 mm (3/8 inch) deep. Just add water and apply with a trowel. FEATURES &amp; BENEFITS &bull; Easy troweling and smooth finishing &bull; Superior bonding &bull; Use above and below grade USES For parging smooth and leveling imperfections on concrete blocks or poured concrete walls, above and below grade. Use to level imperfections up to 10 mm (3/8 inch) deep. It may also be used on painted concrete and wood surfaces (see Surface Preparation 2 below). PROCEDURES Mix and substrate temperatures should be maintained between 5 &ordm;C (40 &ordm;F) and 30 &ordm;C (86 &ordm;F) for at least 24 hours prior to and 48 hours after. Mixing: Empty contents of bag into mixing container. Add approximately 4.0 L (4.25 qts) of clean water per 25 KG (55 lb) bag or enough to achieve a workable mix. Avoid a soupy mix. Excess water reduces strength and durability and can cause cracking. In cold weather, use warm water to accelerate the set. In hot weather, use cold water to slow the set. Surface Preparation: Surfaces to be repaired must be structurally sound and clean. Remove all delaminated or unsound concrete by chipping with a hammer and chisel or using a stiff wire brush. Clean the area to be repaired with potable water, leaving the concrete saturated but free of standing water. Some very porous concretes may require several applications of water to ensure complete saturation. Placing: Application to clean, sound, concrete blocks and poured concrete, proceed to Surface Preparation 1. Application to loose, unsound or painted concrete and wood surfaces, proceed to Surface Preparation 2. Surface Preparation 1: Application to clean, sound, concrete blocks and poured concrete. Thoroughly saturate the area to be parged and remove any free standing water. Some very porous concrete may require several applications of water to ensure complete saturation. After mixing apply SAKRETE Parging Mix, by trowel, to a damp surface not exceeding 10 mm (3/8 inch) in thickness. If a greater thickness is required, rough-up surface with a coarse broom and allow to harden for 24 hours before repeating process. Surface Preparation 2: Application to loose, unsound or painted concrete and wood surfaces. Mechanically fasten galvanized diamond wire mesh to surface. Wood surfaces require 6.8 KG (15 lb) of asphalt-impregnated building paper under mesh. Dampen exposed concrete. After mixing, apply initial layer of SAKRETE Parging Mix, by trowel, level with mesh surface. Rough-up surface with a coarse broom and allow to harden for 24 hours. Then, thoroughly saturate the area with clean water and apply a finishing layer to a damp surface not exceeding 10 mm (3/8 inch) in thickness. Finishing: It is recommended to use a wood, magnesium or aluminum float trowel for a smooth surface. For a textured surface, use a broom or brush. CURING Curing means maintaining proper moisture and temperature. Allow newly placed material to set until surface is hard to the touch. Then keep material damp or cover with plastic to prevent evapouration of mix water for at least three (3) days. Protect from freezing for at least 24 hours. TECHNICAL DATA Initial Set: Approximately 6 hours Compressive Strength: 7 Day 8.5 MPa (1200 psi) 28 Day 12.5 MPa (1810 psi) Thank you for your inquiry.